What do you think about that? Are large companies doomed to a life of BAU at best, and bankruptcy at worst? Whilst it is true that current technologies, from SMAC to IoT and others are removing barriers to competition. 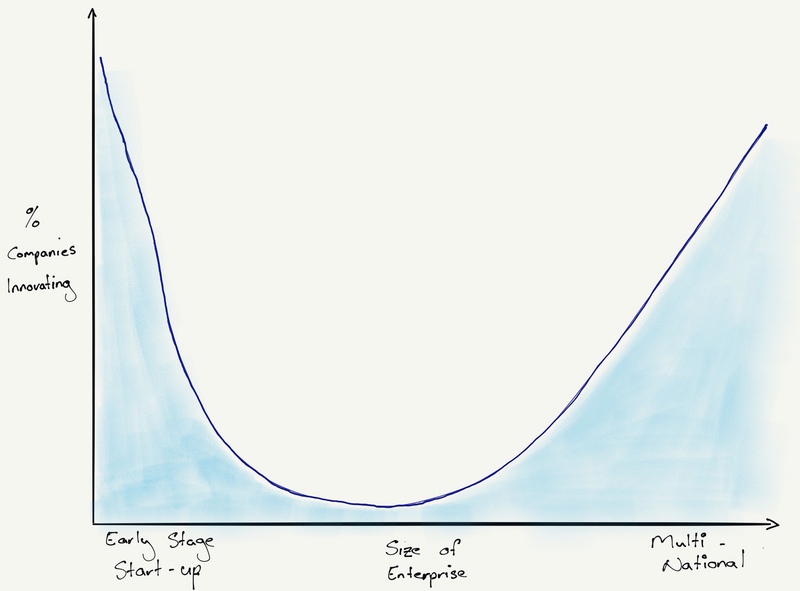 There is a race condition between large organisations' ability to restructure themselves around agility, and start-ups achieving the scale they need to disrupt marketplaces. It is not true that start-ups, far less small business, hold the brains trust on innovative creativity. Chances are names such as Apple, Samsung, Google, Microsoft, Facebook, Amazon, perhaps Intel, maybe even CBA will be on the page. Yep, you may have just listed the largest companies rather than the smallest. And yes, I know that some of them we still consider as startups. Of course they were all startups at one stage. However, for most of them their most recent innovations were as large corporates. Why do we consider large companies as the most innovative, yet hold to the belief that large companies cannot innovate? All of the most innovative companies, almost by definition, have a strategic intent to innovate. For the most innovative, this is pervasive. Wave One – New products and services in the next 12 – 18 months. This is the area most start-ups work in. Many companies struggle to bring new products to market within this timeframe because of Corporate Antibodies. Even Microsoft used to operate on a 3 year upgrade cycle. Not anymore. Wave Two – Innovations for the next 18 months to 5 years. This takes more investment and far more risk, especially with the increased rate of technology change. The increased risk also increases the rate of failure. Nevertheless innovative leaders have a roadmap that drives innovation through this time horizon. 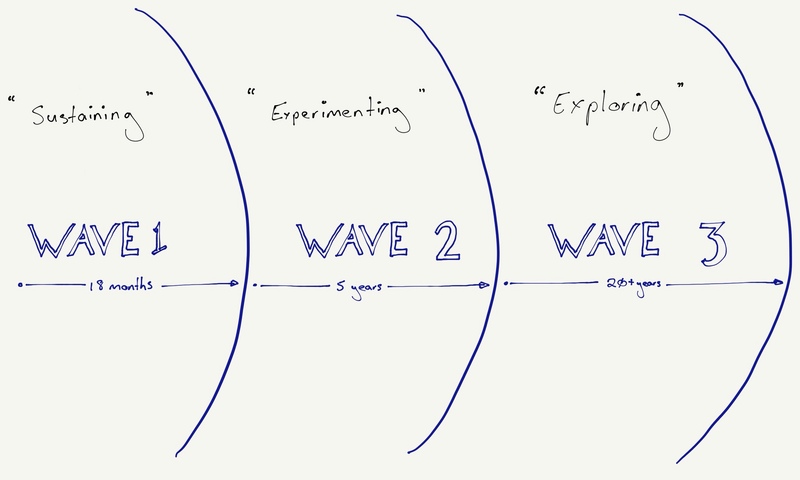 Wave Three – Innovations for the next 5 to 20+ years. Only the richest organisations can fund 'Blue sky' research projects of this nature. Many innovative companies: Pharmaceuticals, Oil & Gas Exploration, Travel & Transport, operate almost solely in this area. Start-ups that capitalise here often emerge from long-term government funded research. All of the innovative enterprises have a strategy that invests in all three waves. Actually all the leading national economies employ strateges that facilitate innovation through all three waves. These companies are all architected around digital technology. IT is no longer considered a support layer driving cost efficiencies like productivity, but the company exists almost entirely because of IT. Put another way, IT increasingly, or solely, drives revenue generation and development of new products and services. This is risky because as mentioned above, digital is a great leveller. The diseconomies of scale can easily outweigh the economies. This means these organisations continually need to transform cost structures and operations to benefit. These companies all benefit from the exponential power of network effects. Many of these organisations are already considering the IoT as we move from Systems of Engagement to Systems of Insight. All of the companies above now provide platforms for others. They have transformed from a vendor of products and services to a platform for others to build their businesses upon. Apple doesn't just sell iPhones, but provides the most lucrative platform for software developers, musicians, authors and together with IBM, soon businesses. Microsoft has been doing this, in enterprise, for years. Not only have the leaders in innovation developed world changing products and services, but they have innovated entirely new business models. Both internally, and for their customers. Amazon has entirely changed the way that businesses can sell, warehouse, and distribute products. With AWS they've entirely changed procurement and budget cycles. It turns out that both competing viewpoints, viz. the most innovative companies are also large enterprises, and large companies struggle to innovate like start-ups, are not mutually exclusive. Rather there is an inverted bell curve. The most innovative companies are at both ends of the scale spectrum, with a large number of organisations in the middle. The question then becomes, what is your organisations strategic approach to innovation, and how can you improve this to succeed in the digital economy? Previous Previous post: What Your Wake Can Teach You About Life.